The New! And! Improved! Matterhorn! Bobsleds!!!!!!!!! I finally got a chance to take a spin on the newly refurbished Matterhorn Bobsleds, which closed this past January and opened on June 15th, the same day as Cars Land, and also my birthday. Coincidence? You tell me. Q: Which Disneyland attraction was the world’s first tubular roller coaster? A: The Matterhorn! Q: Which Disneyland attraction straddles both Tomorrowland and Fantasyland but is officially considered a Fantasyland ride? A: The Matterhorn! Q: Which Disneyland attraction features two different tracks with a different queue for each track? A: The Matterhorn! Q: Which Disneyland attraction used to have a big hole where the Skyway traveled through? A: The Matterhorn! Q: Which Disneyland attraction is exclusive to Disneyland and not found at any other Disney park? A: The Matterhorn! Q: Which Disneyland attraction used to have a half-court basketball floor inside? A: The Matterhorn! 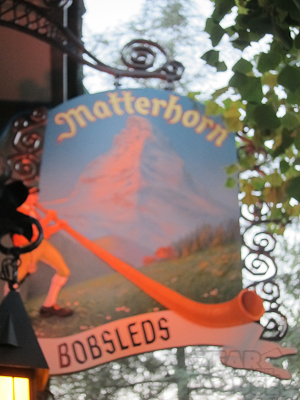 Q: Which Disneyland attraction is properly named Matterhorn Bobsleds? A: The Matterhorn! 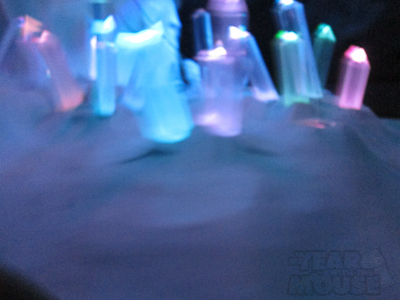 Q: Which Disneyland attraction is a thrill ride completely inside a building running in near-total darkness? A: Space Mountain! There are three main changes from before the recent refurb: New bobsleds, new height requirement (now 42″), and new paint. 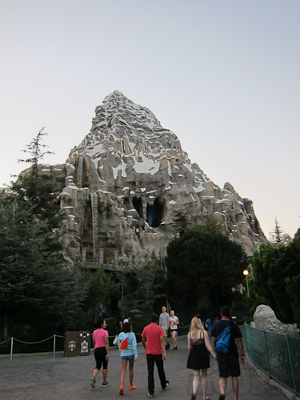 The mountain was repainted to better reflect the snow, or more specifically the patchy lack of snow, on the real Matterhorn. The old bobsleds required you to ride in the lap of the person behind you. This had its advantages and disadvantages. One distinct advantage was that it was the perfect date ride. Not only do you have to snuggle, it’s a thrill ride, which offers the opportunity to do some extra “consoling” when necessary. On the other hand, it was pretty awkward seating if you were just with friends. And as someone who was always the shortest person in the group, not gonna lie, it got uncomfortable at times. 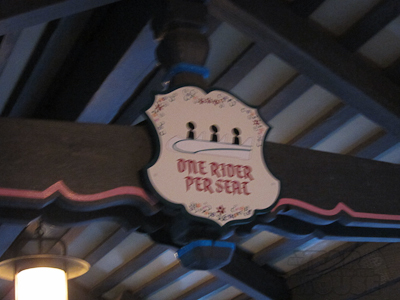 In fact, many people requested their own sled, which seriously decreased the ride capacity (and thus increased the wait for the ride). The new bobsleds have individual seating and room for six. But first I’m going to talk about the line. Heh. The queues start along either side of the mountain and wrap around. Once you reach the loading dock, you get to the adorable little chalet overhang and switchbacks. Two single rider lines, actually. One for each side. 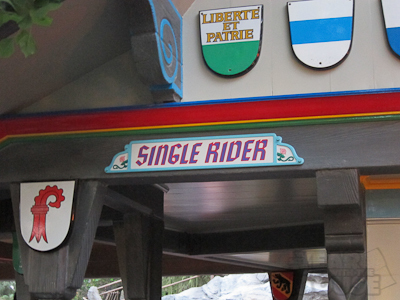 This is very convenient if you happen to be a single rider, or you don’t mind splitting up your group and all riding separately. On a side note, when we lived in Hamburg, Germany, they had this thing called the Night of the Museums in which every museum in the city (and there were a large number of them) stayed open all night and you bought a ticket and could go to any of them with buses in between to take you there. It was awesome. One of the ones we went to had a live demonstration of those giant horn things. They’re pretty impressive. And long. This sign used to tell you how to sit in the bobsled, smaller person in front and so on. Now, one rider per seat. You’d think that would be obvious. The seat comfort leaves a lot to be desired. As you can see, the restraint is a simple seatbelt. Seriously, tall people, don’t ride Row One. The other seats have a little more legroom because there’s an indentation on the sides of the seat in front of you that offers some extra foot space. Here’s a really great picture I took of my own leg, sitting in Row Three. 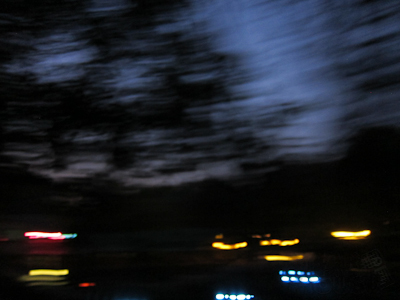 The ride is the same. I had hoped they would smooth out the tracks some, but I didn’t find any difference in the Tomorrowland side, and maybe only a slight improvement on the Fantasyland side. What’s the difference between the two sides? Well, when parallel, the Tomorrowland side is on the inside side of the mountain, which means that all of its turns are steeper and more sudden. It gives the illusion of going faster, although your speed really depends on the amount of weight in your bobsled (like Space Mountain). The Fantasyland side feels smoother, but tamer, and is a tiny bit longer. Honestly I think I like the Tomorrowland side better. You get bounced around more, but I think it’s a more exciting ride. You start out on the same lift, where you see some snow falling against a blue background, which I guess is supposed to represent outside or something. You also pass some colorful ice crystals. Is this what the inside of the real Matterhorn mountain looks like? Keep in mind that we are actually moving at this point. The abominable snowman makes an appearance–twice, actually. And you see his glowing red eyes another time. I’ll be honest, when I was a little kid, the abominable snowman scared the ever-living crap out of me. And when I was riding this time on the Tomorrowland side, I had forgotten where he appears and it startled me again. I’m such a wimp. Also he’s very hard to photograph, which is probably why he still remains an undocumented legend. The sights from the ride on the Fantasyland side are very cool. 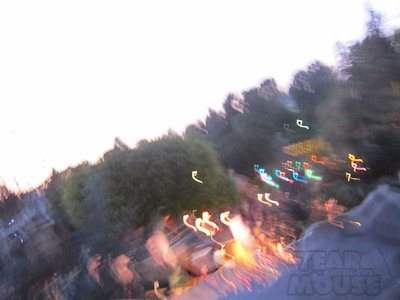 As you can clearly see in great detail in this picture, I rode this in the middle of the Soundsational parade. As usual, I got all kinds of strange looks from people wondering why I was holding my camera up and just pressing the shutter button repeatedly in the hope that I’d get at least one usable shot. Ride photos are hard, people. Awesomely, Disney donated two old Matterhorn bobsleds to the National Roller Coaster Museum. I didn’t even know there was a National Roller Coaster Museum, but there ya go. I am going to miss the snuggling. You can still get the snuggling experience at Splash Mountain. 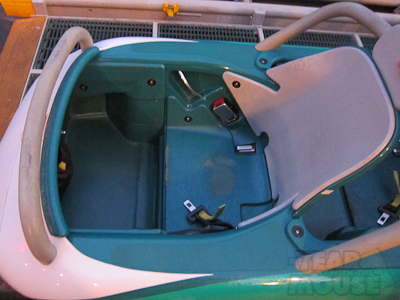 However, when they exported Splash to other parks (WDW and Tokyo) they incorporated side-by-side seating, mostly because it increases rider throughput, but also because Japanese guests have worse personal space issues than we do, and snuggling was not considered appropriate for them. I believe they eliminated the snuggle seating on Splash Mountain and each seat is now separated by a short back, except for the rearmost seat which can fit an adult and a child, but not two adults. Thanks! 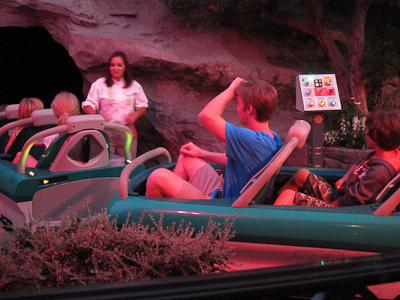 Yes, I had heard the ride was smoother but I don’t really think it is, at least not on the Tomorrowland side. 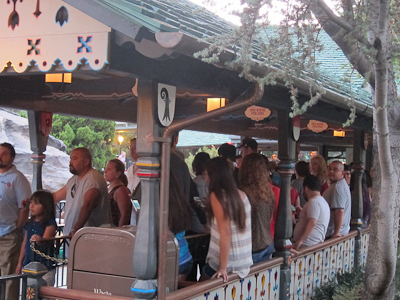 Oh Shelby, you, me and the Matterhorn Bobsleds will never be the same…. Shelby, Thanks for another great column. I remember once riding the Matterhorn in the rain. What fun! I can’t wait until my next trip to the park in November. I’ve never ridden it in the rain! That would be awesome, going in and out of the mountain like that. I, for one, am glad they are separate seats! I have a very awkward memory of riding with my guy friend. 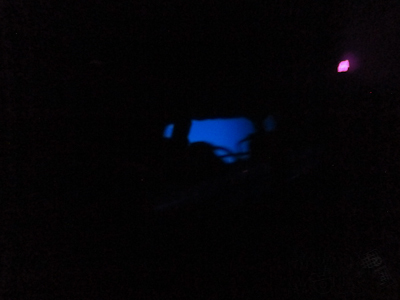 We squished into one because we assumed they were loading people behind us, only to find all our friends laughing at us as we came to the end of the ride. He and I were so insanely squished and there was NOBODY riding behind us. We laughed, we blushed. It was great. I rode the Tomorrowland side a few weeks ago. The last time I rode it was almost 20 years ago. So perhaps my memory is bad, but it just seemed like the Matterhorn is so tame now. 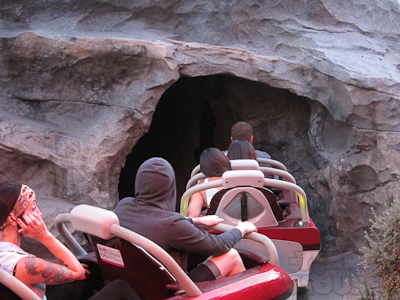 Before, you would walk by the Matterhorn and hear people on the ride screaming. Now, nutthin’. I also miss the bumpy ride of the old cars; it’s a bobsled ride, so of course it’s going to be bumpy! I did enjoy my encounters with the Snow People, though. It’s hard to freshen up the Snow People, and they did a good job.